Temi claims to have created "the world's first truly intelligent, mobile, personal robot for your home. The company has partnered with Amazon to include the Alexa personal assistant in its robots. The combination of AI and autonomous navigation allows the personal robot on wheels to follow a user at home or in the office and perform a variety of tasks via the user's camera and smartphone. The robot also understands voice commands, using an interface developed by the company. For now in English but soon in other languages, according to the company. The robot has a 10,1'''. HD LCD screen that mimics a head on a body 1 meter high and weighs 26-pound (12 kg). The screen angle is constantly adjusted to the position of the user's face to help with communication, and the many speakers and microphones on the robot's body help with music, videos, games and phone calls. Temi can also serve as a mobile home hub that allows users to manage smart devices. The real innovation, however, lies in the software that enables autonomous navigation by analysing data collected via the cameras and sensors using algorithms that make a 3D map of the space around the robot. This enables Temi to plan its path, avoid obstacles on its way and follow users. The robot can move at one meter per second, with independent motors and four wheels that guarantee the stability of the movement. It can work for eight hours and goes independently to its docking station if charging is necessary. In terms of privacy, cameras and microphones record nothing unless they are told to do so. Temi further has a possibility to activate a lens cover for the camera. 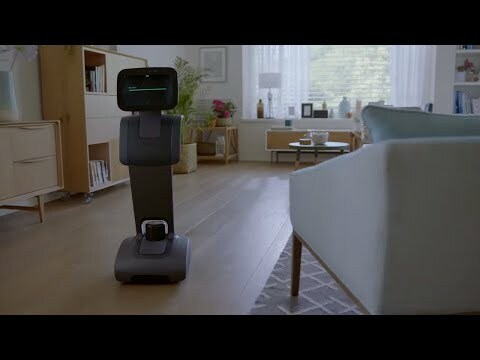 The Temi robot is available for $1.499,- The first deliveries are expected in March 2019.